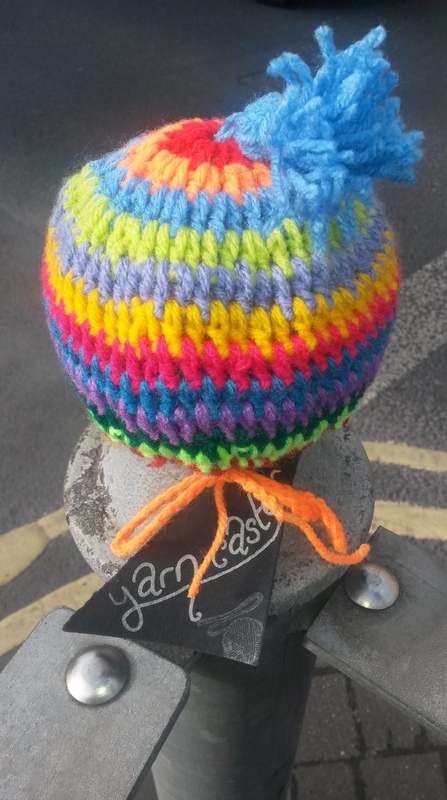 It has already begun, with a scattering of woollen goodies popping up in and around Lancaster, you may well have spotted some of them! These woolly wonders are the result of a few hours work, aimed at bringing a little colour to the city, and they have been drawing the odd smile out of unsuspecting visitors to the area. Something woolly this way comes…Don’t be sheepish this October! Come and discover some of Lancaster’s hidden gems by following a delightful trail of woolly wonders around the city. Marvel at the amazing artworks lovingly handmade by the members of our local community! All of which have been created to coincide with British Wool Week and will be distributed to local charities at the end of the week. Bank Holiday Bobble hat yarnstorm!